The Oxford Handbook of Carl Schmitt collects thirty original chapters on the diverse oeuvre of one of the most controversial thinkers of the twentieth century. Carl Schmitt (1888-1985) was a German theorist whose anti-liberalism continues to inspire scholars and practitioners on both the Left and the Right. Despite Schmitt's rabid antisemitism and partisan legal practice in Nazi Germany, the appeal of his trenchant critiques of, among other things, aestheticism, representative democracy, and international law as well as of his theoretical justifications of dictatorship and rule by exception is undiminished. Uniquely located at the intersection of law, the social sciences, and the humanities, this volume brings together sophisticated yet accessible interpretations of Schmitt's sprawling thought and complicated biography. The contributors hail from diverse disciplines, including art, law, literature, philosophy, political science, and history. 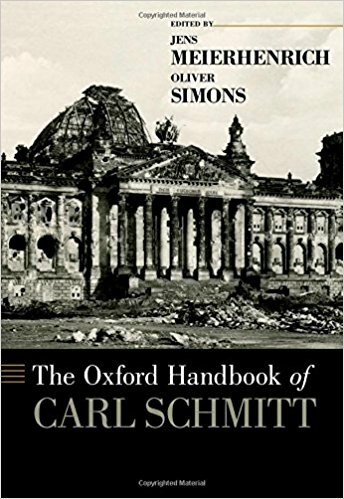 In addition to opening up exciting new avenues of research, The Oxford Handbook of Carl Schmitt provides the intellectual foundations for an improved understanding of the political, legal, and cultural thought of this most infamous of German theorists. A substantial introduction places the trinity of Schmitt's thought in a broad context.